The first of the massive fuel tanks that will fly on the maiden launch of NASA’s SLS mega rocket in late 2018 has completed welding at the agency’s rocket manufacturing facility in New Orleans – marking a giant step forward for NASA’s goal of sending astronauts on a ‘Journey to Mars’ in the 2030s. Technicians have just finished welding together the liquid hydrogen (LH2) fuel tank in the Vertical Assembly Center (VAC) welder at NASA’s Michoud Assembly Facility (MAF) in New Orleans. The VAC is the world’s largest welder. This flight version of the hydrogen tank is the largest of the two fuel tanks making up the SLS core stage – the other being the liquid oxygen tank (LOX). In fact the 130 foot tall hydrogen tank is the biggest cryogenic tank ever built for flight. “Standing more than 130 feet tall, the liquid hydrogen tank is the largest cryogenic fuel tank for a rocket in the world,” according to NASA. And it is truly huge – measuring also 27.6 feet (8.4 m) in diameter. I recently visited MAF to see this giant tank when it was nearly finished welding in the VAC. I also saw the very first completed test tank version of the hydrogen tank, called the qualification tank which is virtually identical. The precursor qualification tank was constructed to prove out all the manufacturing techniques and welding tools being utilized at Michoud. NASA’s agency wide goal is to send humans to Mars by the 2030s with SLS and Orion. 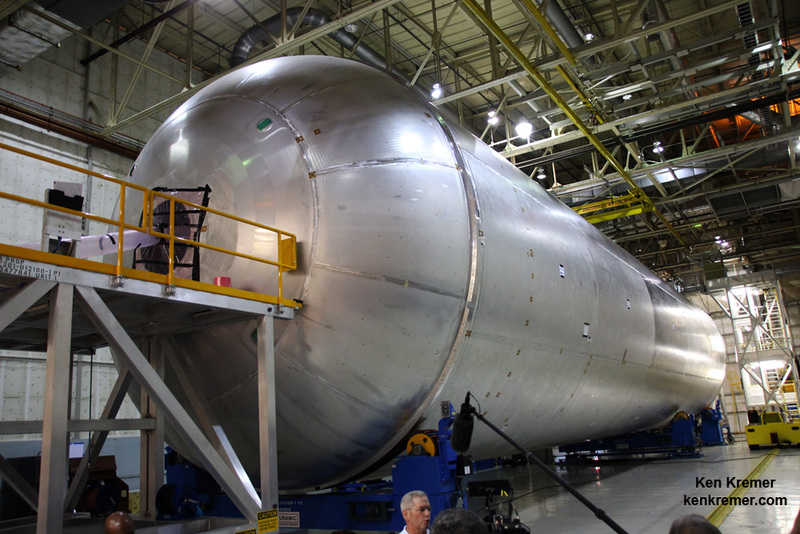 The LH2 and LOX tanks sit on top of one another inside the SLS outer skin. Together the hold over 733,000 gallons of propellant. The SLS core stage stands some 212 feet tall. The vehicle’s four RS-25 engines will produce a total of 2 million pounds of thrust.